These are the stairs that I climbed to get into the upper/inner temple. They are steeper than they look, heavily worn, and covered with sand. Fun! I met some monks at the top that I talked to for a while. 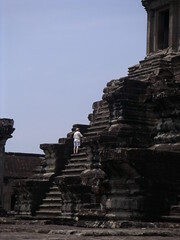 We descended the stairs together and one of the monks asked me if I was afraid. I told him that I was afraid of heights and he replied with "It is no problem to fall. Don't you believe in reincarnation?" Funny guy.